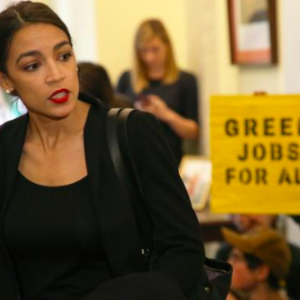 Rep. Alexandria Ocasio-Cortez released the details of her plans for a “Green New Deal” just days ago already the proposal is dividing major green groups. The proposal calls for a radical restructuring of the American economy to transition fully off of fossil fuels in just over a decade. Talk of a carbon-free future is music to the ears of most of the green movement. However, groups tied to the Dakota Access Pipeline protests are rejecting certain portions of the proposal, foreshadowing divides to come. The bill that Ocasio-Cortez produces is certainly radical — anything calling for the full abandonment of coal, natural gas, oil, and nuclear power must be. It has gained the support of many of the largest environmental groups–Greenpeace, the Sierra Club, NRDC, and others. Meanwhile, even those elements do not go far enough for the increasingly-visible wing of the environmentalist left that believes “zero-emissions” still allows wriggle room for industry. “We reject net-zero emissions language (as well as carbon neutral and zero-carbon) because it implies the use of carbon accounting,” writes the Indigenous Environmental Network (IEN) in a policy rebuttal that accused Democratic politicians of failing to listen to their concerns. “This language is the opposite of what we have been demanding. It appears that the policy-makers who use this language are failing to listen to us. First and foremost, if we are to stop climate change, we must create a plan to keep fossil fuels in the ground that includes cutting off subsidies and tax breaks,” they continued. During the DAPL protests in 2016, IEN became an important voice in the environmental protest movement. They are connected to pipeline protests around the country and were a sponsor of the 2019 Women’s March. IEN also criticized how the Green New Deal defined “renewable energy,” rejecting anything that included hydropower or nuclear, and expressed concern that portions of the program dedicated to ecosystem restoration would instead be used for carbon mitigation. Although they phrased their response more delicately, Earthjustice, another environmental group, agreed that the Green New Deal did not go far enough and that zero-emissions needed to be the goal. Ocasio-Cortez has repeatedly stated that she believes the American economy will be able to achieve radical goals with the appropriate (legislative) encouragement. Although the most ambitious climate action bill to be introduced, the measures fall short of what Ocasio-Cortez had originally proposed. Some of the changes Earthjustice and other green groups are pushing for, such as the call for renewable rather than net-zero carbon emissions, were in an earlier version of the Green New Deal. Changes like this, which make the Green New Deal more palatable to a political coalition, are bound to expose tensions within the green movement. Over the past eight years, the Democratic party has moved steadily to the left on climate issues, leaving Democrats from energy-producing states, like Sen. Joe Manchin (WV), in the difficult position of alienating their party or their voter base. To pass, a climate-change policy would need to balance this with the demands of an increasingly radical and demanding green movement, which has shown itself unafraid of taking to the streets in very visible protest against policies seen as too lukewarm. The initial text of the Green New Deal is in some ways the opening of negotiations between all of these groups. In fairness, with a Republican president and Republican control of the Senate, passage of a major climate reform bill is unlikely. Debates around the bill, however, are likely to show the shifting alliances within the Democratic coalition.